Middle Eastern -- 184 percent higher than national average. Diners -- 47 percent higher than national average. Hot dogs -- 43 percent higher than national average. Pizza -- 43 percent higher than national average. Soup -- 40 percent higher than national average. I feel like our love for Middle Eastern food makes us look pretty respectful, especially compared to those buffet-loving Minnesotans and Iowans. 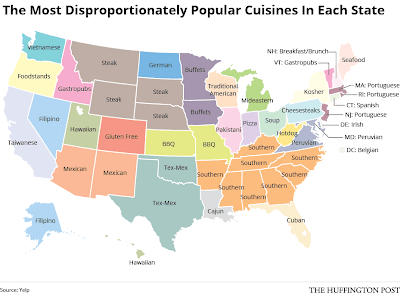 When you dig deeper into our top 5 though, you can definitely see our love for coney dogs in the data.